Has there ever been a more magical baseball time in the Corvallis area than the year 2018? This past spring and summer, OSU’s Goss Stadium was filled with record crowds and showcased the highest caliber of collegiate baseball. For the Corvallis Knights, things got started at Goss Stadium at Coleman Field on Wednesday, May 30th before a franchise record crowd of 3,581 on its 7th annual Science, Engineering & Art Day. Even with LB’s Knights, the hometown team lost its opener to its old friends – the always entertaining Portland Sea Dogs, 5-4. It was a curious start to the season, and the Knights first non-league loss since 2008 breaking a 50-game non-league winning streak dating back to July 31, 2008, their last out-of-conference loss to the Gresham Mountaineers, 2-1. From there, Corvallis would head to Northern California to play its great friends in baseball the Humboldt Crabs for the first time since 2009 in Arcata. The team headed down without its skipper Brooke Knight and Utah frosh-to-be Briley Knight. The father and son had an important date to keep at Volcanoes Stadium in Keizer, Oregon on Saturday, June 2, as Crescent Valley High School of Corvallis had advanced to the 5A State Championship Game vs. Crater. The elder Knight was assisting CV head coach Ryan Starwalt and his son Briley was the Raiders star player – the Oregon 5A Player of the Year. 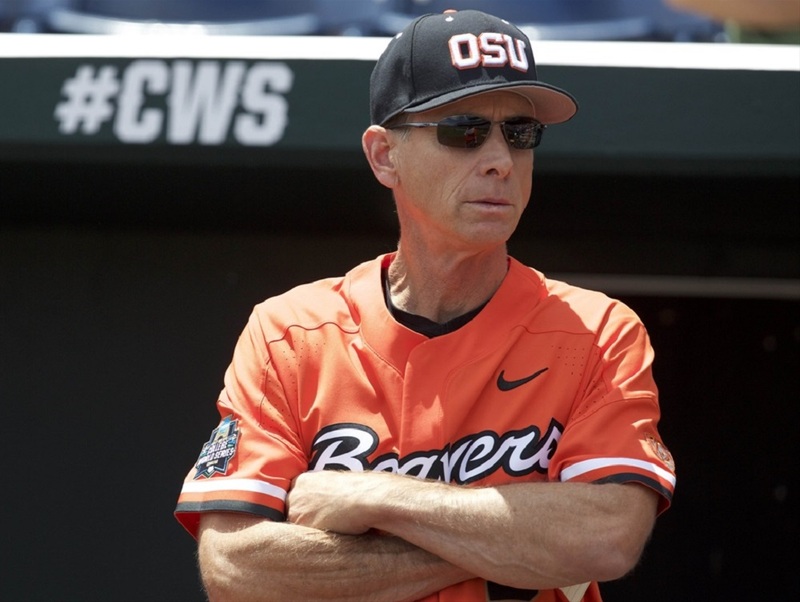 Meanwhile, head coach Pat Casey’s Oregon State Beavers were hosting a NCAA Regional, which it swept through and wrapped by routing one of the SEC’s finest and the team that had eliminated them at the 2017 College World Series – the LSU Tigers. While the Beavers fared well in Corvallis, the Knights started their season 0-2 losing its first game at Humboldt before a boisterous and sold out crowd of Crabs fans at Arcata Ball Park on Friday, June 1 with new associate head coach Ed Knaggs at the helm. The next day, Crescent Valley’s dream season came to an end as Crater prevailed 2-0. That night, Corvallis and Humboldt would have to wait another day to play baseball as its game was cancelled due to the lights not working at Arcata Ball Park. Staring at an 0-3 start, the Knights came back to win Sunday’s finale at Humboldt as three-year Knight Jacob Fricke of Western Oregon set the tone with a quality start and combined with four other Corvallis pitchers on a shutout while senior-to-be outfielder Chandler Anderson of Utah led the offense going 3-for-5 with a double and triple to lead the Knights to its first win, 5-0. Anderson would be the team’s catalyst from start to finish. He would set Knights single-season records in at bats with 258 and hits with 87 while leading the team in batting average (.337), doubles (20) and stolen bases (26). Corvallis started its 2018 WCL season on the road, a grueling swing through Kelowna, Bellingham and Walla Walla before playing its first home game on Tuesday, June 12; shortly after Oregon State had disposed of Minnesota of the Big Ten in two games in their NCAA Super Regional at Goss to advance to the College World Series for a second consecutive year. After going 2-3 on the road, the Knights would lose its WCL home opener 4-0 to their longtime friends and rivals the Wenatchee AppleSox, 4-0, before a crowd of 2,052. Corvallis would make an uncharacteristic 3 errors in the loss. Errors would come in bunches over the first month of the season. After losing its home opener, Corvallis won four straight series taking 2 of 3 from Wenatchee, sweeping Cowlitz at home and taking two of three at Port Angeles and Bend. From there, the team experienced its most difficult stretch in most recent history getting beat up at home in a much anticipated inaugural series with the Portland Pickles and losing two of three at Goss to Walla Walla. The Knights broke out their brand new CornValley special event jerseys on Tuesday, June 26 to kick-off its Farm to Field Series with the Pickles. The excitement of the series was dampened when the WCL’s newest member – the Pickles – pounded the hometown Knights 17-2, collecting 21 hits while Corvallis made 5 errors. After losing the rubber game with Portland 13-5 (in their CornValley jerseys), the Knights defense collapsed in its next home game vs. Walla Walla committing 7 errors in a Sweets beat down of the hometown team, 18-5. While a low point, Corvallis regrouped behind veteran leadership from Anderson, senior-to-be outfielder Cody Hawken of University of Portland and senior-to-be catcher/infielder Zak Taylor of Oregon State. During the Knights rough stretch, the Oregon State Beavers were shocking the baseball world in Omaha, winning elimination game after elimination game. The never say die Beavs proved to be the toughest and best team in the land by capturing the College World Series finals vs. Arkansas from the SEC. Because of a rainout on Monday, June 25, all three CWS finals games were telecast on ESPN during the Knights home series with the Pickles. In fact, the finale was broadcast live on the Goss Stadium video board for fans to enjoy. Game time was pushed back 30 minutes to accommodate the watch party and both the Knights and Pickles got to experience Omaha’s final out and dogpile while warming up. It was a memorable moment in Knights history, but crowds were sparse much of June while Beaver fans either stayed home to watch on TV or were in Omaha. In total, Knights attendance for the season slipped with Corvallis averaging 1,461 per game and drawing 48,239 fans over 33 home dates. With Oregon State crowned National Champions for a third time, OSU athletics and the Corvallis Knights teamed up to host a celebration party on Friday, June 29 at Goss Stadium that required cancelling the Knights regularly scheduled home game with Walla Walla, which was rescheduled as part of a doubleheader on Sunday, July 1. The event was epic as well as an unscheduled off-day for the Knights. The celebration drew an estimated 6,000 fans to Goss to honor the National Champions on a day filled with sunshine and great enthusiasm. It was for sure the largest gathering ever at Goss Stadium at Coleman Field. The return of three-year Knight and Oregon State starting first baseman Zak Taylor was a big part of turning things around for the Knights. Upon his return, Corvallis was 13-10 and out of contention for the first-half title, which the Knights had owned the past two seasons. The Portland Pickles would win the first half, but Corvallis was starting to position itself for a run in the second half. 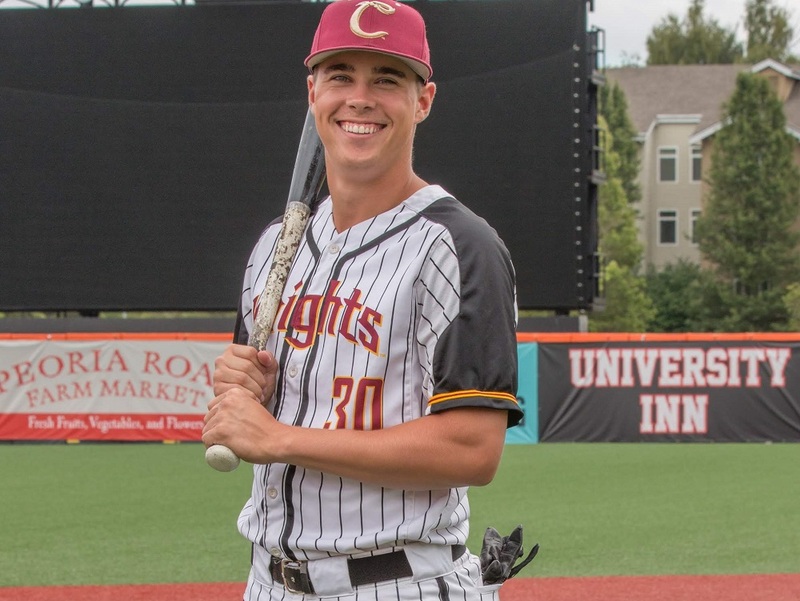 With Taylor back, sophomore-to-be Chad Stevens of University of Portland starting to feel comfortable at second (he started for the Knights in 2017 at shortstop) and with the pitching staff throwing more strikes, Corvallis was poised to get hot, and boy did they get hot, especially at home. Starting with its July 7-9 home series with Victoria, the Knights would rip off 17 straight wins at OSU’s Goss Stadium. The streak was broken by Yakima Valley on the last day of the regular season in a meaningless game for both teams. Regardless, counting the post-season, Corvallis would win 19 of its last 20 games at home. No longer were the Knights playing shoddy defense, now with Stevens and future Oregon State shortstop Beau Philip playing next level middle infield, with Taylor and Cole Hamilton catching well and Anderson playing a stellar center field, the Knights were as strong as ever up the middle. Not to mention youngster Trace Tammaro was playing the best defense in the league at first base, as the incoming frosh at University of Portland would end up leading the WCL in fielding percentage for first basemen at .992. Corvallis literally raced to the finish line, not only playing very well at home, but winning a key series at Portland to even its regular-season series with the Pickles at 3-3, taking the final two pressure-packed games, 6-3 and 6-5. Those wins were a confidence boost as Corvallis would continue to surge, winning 14 of its last 16 regular-season games to capture the South second-half title with a 20-7 record. For the summer, Corvallis went 27-6-1 at home and finished with a 44-20-1 record (the tie being against the Gresham GreyWolves in a non-league game called by mutual agreement in extra-innings because both teams had run out of pitching). While the Knights started to pitch well and play outstanding defense in July, the 2018 club could really hit, from beginning to end. Corvallis .284 overall batting average was its best since joining the West Coast League in 2005. They tied Kelowna for the best average in the WCL at .287 and led the league in doubles with 101. Senior-to-be right fielder Austin Feist of St. Martin’s led the West Coast League in RBIs with 41, and led the Knights in homers with 7. The Knights all senior outfield of Anderson, Hawken (.331, 10 doubles, 3 HR and 30 RBI in WCL play) and Feist was arguably the most offensive in the West Coast League. Anderson led the league in at bats with 220, games played with 54, hits with 70, doubles with 16 and total bases with 101. Sophomore-to-be outfielder Cole Cabrera of Cal Poly spelled all three throughout the summer hitting .250 with 9 doubles, 9 stolen bases, a homer and 19 RBIs over 100 at bats; finishing with a clutch two-out, two-run single in the WCLCS finale to put Corvallis up 5-1 over Kelowna. Chad Stevens not only learned a new position and played it well late, but he made significant strides offensively leading the WCL in triples with 6 and finishing second in the league to Anderson in hits with 67 and total bases with 97; and second in the WCL in runs scored with 42 while hitting .311 overall with 12 doubles, 3 homers and 34 RBIs. The Knights 2018 starting shortstop, junior-to-be Beau Philip of Oregon State, was steady if not spectacular in the field and also contributed greatly offensively hitting .307 overall over 51 games played and 179 at bats with 31 runs scored, 11 doubles, 3 home runs and 20 RBIs. His exceptional performance in the WCLCS earned him WCL Player of the Week honors. Third base was manned by many throughout the season, but Stanford sophomore-to-be Brendan Beck took hold of the spot in August playing solid defense and hitting .243 in WCL regular-season play. First base was anchored by Tammaro, who hit .296 overall with 4 homers and 34 RBIs. The left-handed hitting slugger excelled in the post-season, hitting .455 with a home run and 5 RBIs. Zak Taylor and Cole Hamilton both caught well and had good offensive seasons. Taylor hit .263 overall with 12 doubles, 3 home runs and 21 RBIs while Hamilton, a 23rd round pick of the Washington Nationals in the 2018 MLB June draft, hit .333 over 117 at bats with 13 RBIs. Hamilton finished the latter half of the season hitting in the two-spot in the lineup, effectively moving over runners as an adept bunter. Briley Knight played outfield, third, second and catcher as the club’s utility man. The future Ute stole 15 bases for the summer, and drew 18 walks while collecting 156 at bats, 33 hits, 8 doubles, 4 triples and 21 RBIs. Pitching, as always, wins championships and coach Camus’s staff shined when it meant the most – in the post-season. The staff progressed very nicely throughout the summer under the tutelage of Camus and assistant coach Youngjin Yoon. Ace Landen Bourassa of University of San Francisco led the staff, going 5-1 and posting the league’s lowest ERA at 1.95. 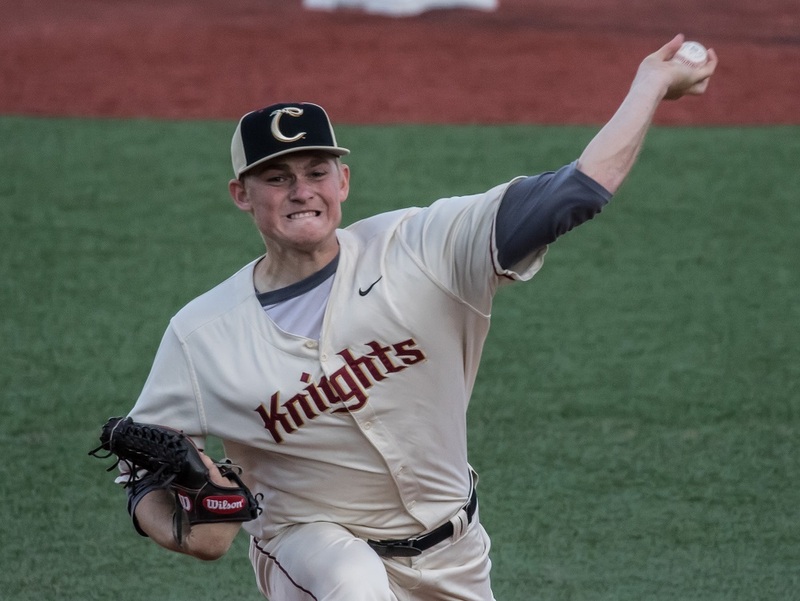 His start at Portland in the post-season, 8 innings of one-run ball, earned him WCL Pitcher of the Week honors and the Knights a shot at a three-peat. Junior-to-be right-hander Connor Knutson of University of Portland got the Knights off to a great playoff start with a stellar home start vs. the Pickles in game one of the WCL South Divisional Series. Knutson (4-2, 4.25) led the Knights in innings pitched with 55 and strikeouts with 51. Cameron Haskell of University of Arizona emerged as a key contributor both as a starter and out of the bullpen. His last appearance was in game one of the WCLDS where he tossed 4 innings of one-run relief vs. the Pickles to put the Knights in position to win. The senior-to-be right-hander went 5-2 overall with a 3.43 ERA. Returnee Kolby Somers of University of Oregon finished the season as a starter, and won game one of the WCLCS at Kelowna. The sophomore-to-be southpaw went 4-1 with a 3.14 ERA and recorded 3 saves over 12 appearances, 3 starts and 28.2 innings pitched while striking out 31 and walking 13. The WCLCS finale start went to two-year Knight Connor Redmond of Cal Poly. Like his 2017 post-season start, he delivered, big time. Redmond’s outing earned him WCL Pitcher of the Week honors, as he held Kelowna to one run over 6 2/3 innings pitched to record the championship game win; only allowing four hits and a walk while striking out 8. For the summer, Redmond made 10 appearances and 7 starts, going 3-1 and posting a 3.32 ERA. Starting pitching was critical to the Knights strong finish, but maybe even more key was the club’s bullpen where three-year Knight Louis Crow of San Diego and sophomore-to-be Abbott Haffar of UC Riverside emerged as stoppers. Solid relief was a crucial to the Knights leading the league with an 11-5 record in one-run games. Haffar finished the season for Corvallis with 2 1/3 innings of perfect relief vs. Kelowna in the WCLCS finale, earning the save. He also picked up the win in relief in the finale of the Pickles/Knights South Divisional Series. For the summer, Haffar was masterful, making 13 appearances and logging 31.2 innings while going 5-0, registering 3 saves, striking out 33 and posting a 1.14 ERA. Crow won game one of the WCL South Divisional Series vs. Portland and earned a save in game two. The junior-to-be led the Knights in saves with 5 and appearances with 18. Before being shut down late in the season, sophomore-to-be Eli Morse of University of Portland was one of the Knights stalwarts in the bullpen, making 13 appearances and going 3-0 with a save and 1.15 ERA. In the end, Corvallis pitching and defense hit on all cylinders while the offense kept constant pressure on its opponents. It all translated into a third straight WCL title for Corvallis, its sixth overall West Coast League championship adding to crowns in 2008, 2011, 2013, 2016 and 2017 – all led by four-time WCL Coach of the Year Brooke Knight. This year’s post-season was one for the ages as the WCL South Divisional Series was arguably the most competitive in West Coast League history with both games going extras, with the Knights winning at home 3-2 in 10 innings and at Walker Stadium in SE Portland 4-1 in 11 innings; knocking out the Pickles who had posted the league’s top mark at 37-17. The WCLCS matched two of the original members of the league, Corvallis and Kelowna for the first time. The Falcons, longtime partners and friends, upset Bellingham in the North Divisional Series to set up a WCLCS match-up of founding WCL members. Corvallis went 6-0 versus Kelowna in the regular season and would sweep the Falcons in the post-season as well, winning convincingly at Kelowna 17-6 – the team’s third trip Elks Stadium in 2018 – and at home 5-1 to finish 8-0 against the Falcons. 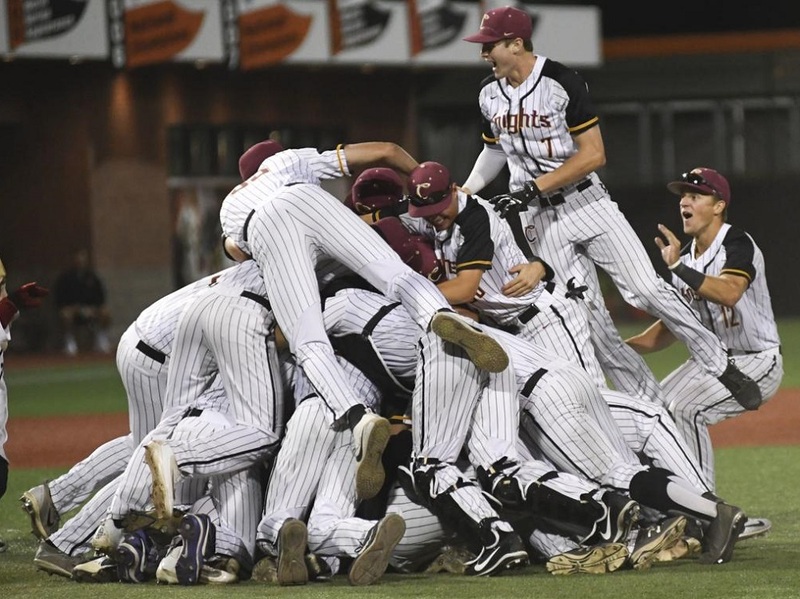 It was a baseball season like none before in the Corvallis area, with it all ending with another dogpile at Goss Stadium – the home of collegiate champions.